Every swimming pool owner knows what a dreary task it is to clean a pool properly. Luckily, there are so many gadgets in the 21st century that are meant to make our lives easier. One of them is a robotic pool cleaner. There are many different types of Dolphin robotic pool cleaners available on the market, but the Dolphin Triton Plus is one of the most advanced. All Maytronics products use the same technology and are packed with amazing features such as the delayed start feature, rapid-clean cycle options, automatic weekly timer, gyroscopic navigation, and patented swivel cable. The best thing about these cleaners is that you don’t have to connect them to your pool system at all, making it incredibly easy to use the cleaners. Every feature of the Dolphin Triton Plus was designed with precision to provide maximum performance. This beast of a robotic cleaner will thoroughly clean your pool while consuming as little energy as possible. In addition, it comes with certain smart features other robotic pool cleaners don’t have such as vertical cleaning, Bluetooth remote control, and a smartphone app. The only downside of the Triton Plus is its price. However, considering all the features it comes with, the price tag is completely justified. What sets this robotic pool cleaner apart from all others is its incredible cleaning power. 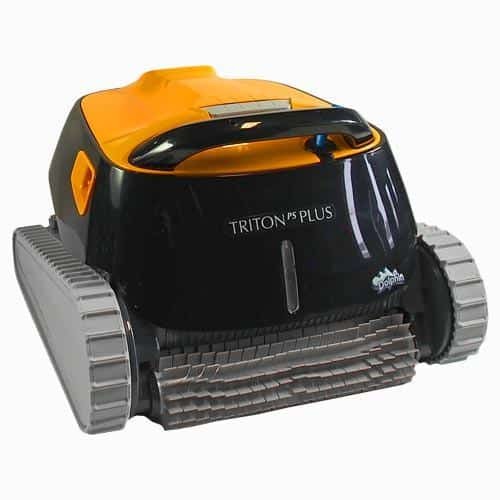 Triton Plus comes with a large brush that spins twice faster than the robot moves, making sure that even the most stubborn dirt is removed. This brush system is especially useful if you haven’t cleaned your pool in a while and there is a lot of dirt stuck on the floor and the walls of the pool. Yes, you’ve read that right. This unit can also clean the walls of your pool as well as the waterline thanks to the PowerStream feature. This feature activates multiple water jets when the cleaner starts climbing vertically, pressing it strongly against the wall. Thanks to the PowerStream, the Triton will never struggle with cleaning the walls and steps and it will do a perfect job in one pass. When you place the Dolphin Triton Plus in your pool for the first time, you might get confused a bit since the cleaner will look as if it is wandering around for no reason. However, by the second session, it will already have a worked-out strategy for cleaning your pool. This is the result of the advanced CleverClean navigation. The system uses AI software and a number of sensors to map out the shape and size of your pool. Thanks to this advanced navigation, Triton Plus will be familiar with all the curves and corners of your pool after only one run. 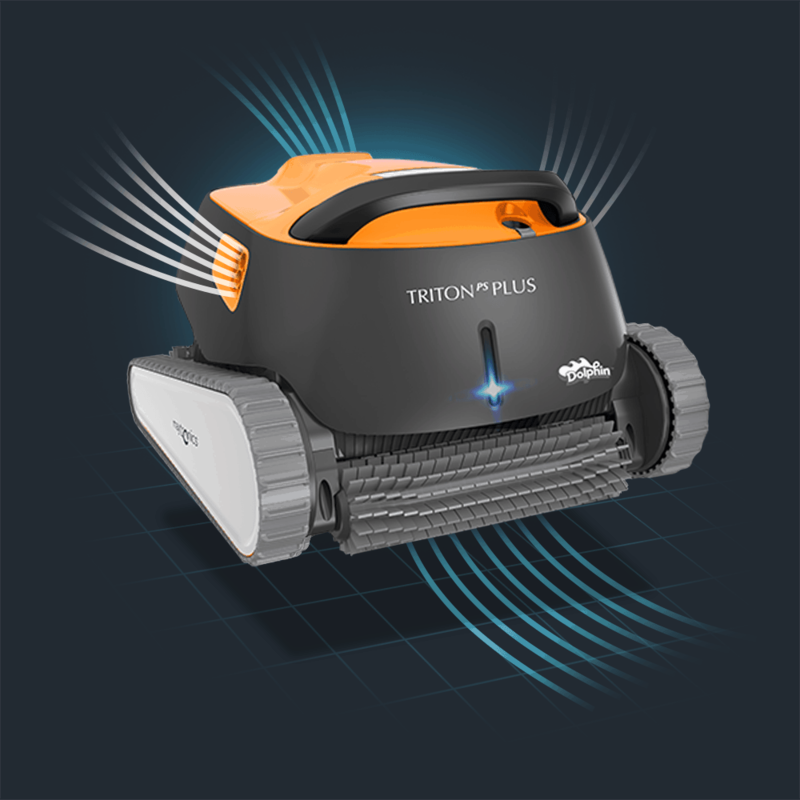 Another unique feature of the Triton Plus robotic pool cleaner is the Bluetooth remote control feature. Many robotic cleaners come with a remote control. However, the user has to use a special hand-held remote. With the new Dolphin Triton Plus, there are no remotes; you can control your cleaner via your smartphone. To connect and control the device, all you have to do is install the MyDolphin app, which is available for the majority of iOS and Android devices. MyDolphin app allows the user to control the Triton by using a virtual joystick or by tilting the phone in the desired direction. This makes controlling the cleaner a truly exciting experience compared to using a handheld remote control. In addition, you can use the app to set the weekly cleaning timer. Since Bluetooth is required to control the robotic cleaner, you need to be within a 30-foot range. An LED indicator will let you know what mode the cleaner is in. If it is blue, then the autonomous cleaning mode is on. If it is green, then the cleaner is controlled by a smartphone. This Dolphin automatic pool skimmer also comes with the automatic weekly timer. This feature allows you to leave home knowing that your pool will be clean when you get back. You can activate the weekly timer by using the MyDolphin app or by using the control unit which is connected to the cleaner via a cable. You can set the cleaner to automatically clean every day for a week, every other day, or every three days. Once the week is over, you will have to set the timer again. This feature is very useful for people who are not always at home and cannot set the cleaner but still want to have their pool cleaned. Cleans the floor, walls, and the waterline of your pool. Comes with two cleaning cycles – quick cleaning and thorough cleaning. Uses dual drive motors and split brushes. A caddy comes with the robotic cleaner for greater convenience and portability. The cleaner is a little heavy and it weighs 22 lb. Does the cord get tangled easily? No, the Dolphin Triton Plus uses advanced algorithms that keep the cord from tangling. Can the Dolphin Triton Plus be used in a salt water pool? Yes, the unit works great in salt water pools! What filter cartridges come with the Triton Plus? The unit comes with two sets of filters; a fine filter and nylon filter for large debris. If you are not on a tight budget, then you should definitely consider getting the Dolphin Triton Plus. This robotic pool cleaner does an absolutely stellar job at cleaning all different types of pools. One of its greatest advantages is that it comes with so many advanced and unique features. In addition, the Bluetooth remote control and the weekly timer feature will allow you to keep your pool clean even when you are not at home. If you are already willing to invest in a pool cleaner, then you should go for the best because there is no point in getting a robotic pool cleaner if you are going to have to clean after it anyways. This pool cleaner not the one for you? We recommend checking out our reviews for the Solar Breeze NX2 Solar powered pool skimmer or the Dolphin Nautilus Plus.